Gabriel O'Hara, brother to Miguel, our erstwhile Spiderman 2099, gets involved with a woman who is on the wanted list by one of the Corporations, namely, Stark-Fujikawa. She is taken in front of Gabe by some Super Samurai. Gabe immediately runs to his big brother to cry for help. Miguel is being wooed back to Alchemax by Stone himself. To get out from under Stone's eye, he accepts reinstatement and immediately takes Gabe's call. Miguel, affectionately known as “Miggy”, dons the suit and rushes to rescue Gabe's latest girlfriend. He rescue her from the Samurai and then starts a very public battle with the Samurai, who is named The Specialist. He starts the fight to test his own capabilities but unbeknownst to him, “Spiderman 2099”s movements are being watched by Alchemax and publicly broadcasted. The Public Eye, a sort of private/public Security Force are under orders to capture Spiderman, but one of the higher ups takes things into his own hands and has his forces fire on Spidey. These 2 volumes end with Spidey falling to the undercity of New York. “Miggy”? That really is the tone here. A ton of one liners and cutesy quips. Miguel is desperately trying to keep his identity as Spiderman secret from Stone but fooling the CEO of a Mega-Corp isn't easy. Gabe, as the token relative, is a real idiot and I foresee a lot of drama coming from his direction. The Specialist was a bit overblown as a character and was more about showing off how another Mega-Corp worked than as a serious threat or evil villain. It's hard to take him serious when he's spouting off about “Honor” and “Chivalry” while taking a graffiti artist in to be a human experiment. 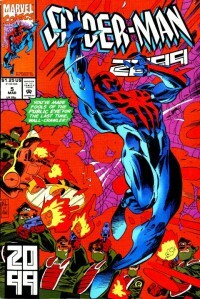 We also get a few panels of Doom 2099. I like that character and hope he's more involved even while he has his own comic line from the time.